You know when you enter certain places and just need to take a deep breath? For me, it's my Mom's house at Christmas time. There's just a lovely smell in the air and I completely feel at home. Does your home have a Scent Decor? If you are looking for one, Unstopables is a superior option. Unstopables is a new, crave-worthy collection of home and fabric care products with sophisticated scents that deliver rich, long-lasting and enveloping sensorial experiences to elevate the everyday. Featuring a fabric refresher, air refresher, scented oil warmer, candle and in-wash scent booster beads, Unstopables lets you style and upscale your environment and wardrobe with sophisticated and fragrant Scent Décor reflective of your signature style. Iconic interior designer, Nate Berkus says, "Scent is key to elevating your decor. It builds an association to you and your home." Unstopables come in three scents - Fresh, Lush and Shimmer. I was lucky enough to receive the Fresh line - and I love it! Speaking of potty training, the Unstopables Air Effects help our washroom stay fresh after it's been used. 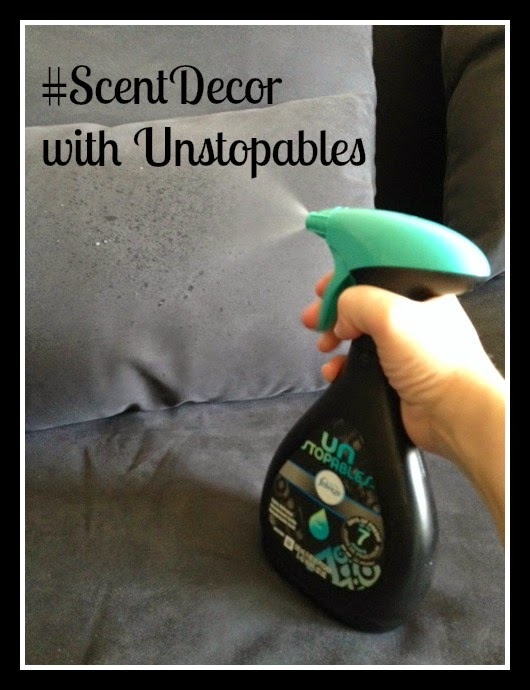 I also love the Unstopables Fabric Refresher - I love using it on my couch. And the Unstopables Candle looks chic on my coffee table and when in use, adds to the room's scent. 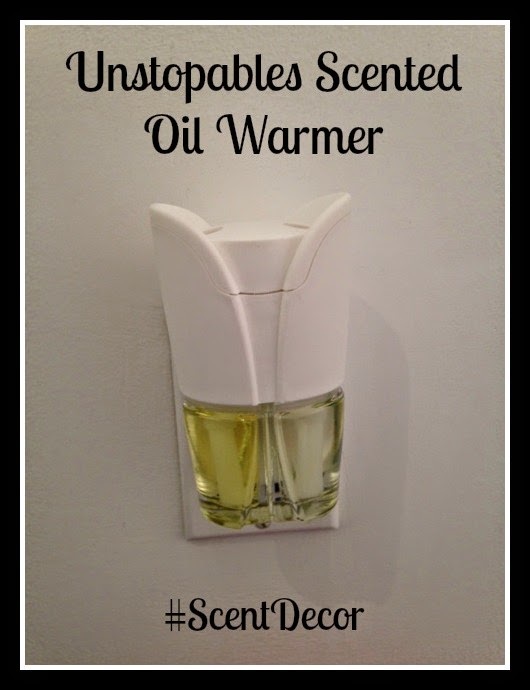 The Unstopables Scented Oil Warmer is easy to use - just plug it in. We have ours in a central area on low, and it still scents three rooms! By entering the following contest you are accepting that if you win your contact information will be shared with a P&G PR and shipping agency for the purpose of mailing your prize. Please allow 4-6 weeks from the contest closure date to receive your prize. This giveaway may appear on other blogs as part of the #PGmom program. However, to be fair, you can only win once per giveaway. If your name is chosen more than once, another winner will be selected. All winners must be from within Canada excluding Quebec. Valid entries only. Contest ends May 20th, 2015. For further contest rules, refer to the Terms and Conditions within the Rafflecopter. I would like to try Lush. I would love to try the fresh scent. I'd like to try Shimmer! I'd have to say Lush! I would like to try the Shimmer. Fresh sounds like a scent that I would like. I tend to like clean, crips scents, so I would like to try the "Fresh" scent. I would like to try the shimmer scent. I'd like to try the Fresh line! I would like to try the Lush scent. I'd love to try the Lush scent. I want to try shimmer! I would like to try the fresh line. I would love the Lush scent most...I think. They all sound lovely. I'm a fresh kind of gal. I'm sure I'd love them all though. I think Fresh would be a nice scent! I would like the Fresh Scent for sure. Bailey Dexter The first one I would love to try in the home would be the fresh scent. Now that I can open the windows what a great clean smell it would leave in the home! I'd like to try Fresh first.